Went the 3 Brasseurs in Old Montreal to watch some hockey and grab a bite. The food was ok, nothing really special. I had the L'Alsacienne pizza which sounded better than actually was: German sausage, sauerkraut, caramelized onions and Québec gruyère cheese. If you are curious about the German sausage, I can save you the trouble; it looks and tastes like a regular boiled hot dog...Disappointing I know. I did finish off the pizza, but I wouldn't try it again. 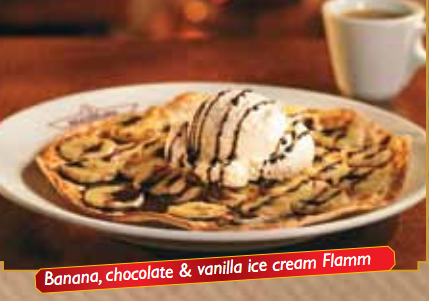 And of course I had dessert: Sweet Flammekueche with bananas and ice cream. It was fine, think of a thin beaver tail (not a crepe) with ice cream on it. It's one of those places for watching hockey games on TV and drinking beer...But, for food I'd pass.